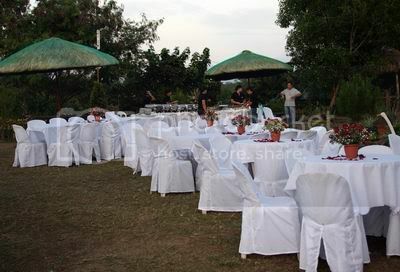 Absolutely Yoneek offers rentals, party planning and catering services to people from the North. The flowers for my BIL's wedding were made by my SIL so am not sure about what they can offer in terms of setup. But the food was really, really great. We couldn't help bingeing on the ribs and their salad kept people coming back for more. Few caterers will get raves from us... but they're definitely one of them. So if you're from Pampanga, let them cater your special occasion. Maybe you can also contact them for food orders for parties. No pics of the food though... so sorry we were famished and exhausted at that point already and it was already dark outside.